Morning Light. I am up early most mornings, but it has been cloudy recently. The light blue and yellow skies, with some pink sometimes, are so pretty. Matching PJs. E and Q got matching pyjamas for Christmas and they wear them occasionally at the same time. When we were in Blue Mountain we all ended up in the same bed. Q had trouble getting settled down, but E held his hand as they both drifted off to sleep. The matching PJs just made it even more special, my heart was full. Folding laundry. I am happy to fold little shirts and pants, and match little socks together. New conditioner. 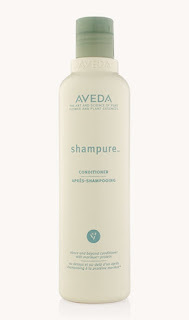 I bought the Shampure conditioner from Aveda the other day. I love opening a new product and the smell is like I've just come from the salon. New spring growth. We cleared away some dead leaves and trimmed the old branches from the garden this weekend. New life is showing through. Nature in the city. In our backyard we have a family of chipmunks living in our backyard, a pair of cardinals, woodpeckers, many squirrels, the occasional raccoon (or four), and other chirping birds. It can be quite the scene at times and that's just our yard, we are lucky we can go for a walk by the Humber River for even more wildlife. You can check out my other Little Things posts here. Matching pjs-- love!! And yay for spring regrow the. It's coming! !